From the first, members of Trinity United Methodist Church have embraced the H.O.P.E. mission and helped in every way. Narda and Henry Marvin and Rev. Norm Jones were the first leaders at Trinity. Baxter Slaughter has been a consistent and creative supporter in multiple ways. 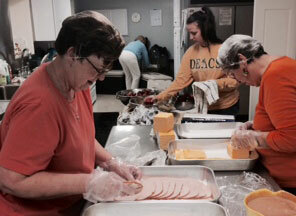 Now, not only does Trinity volunteer in every capacity, they also faithfully pick up ingredients and make 150 lunches every week for the trucks to distribute. Norma Reese coordinates the packing as well as the baking and delivery of hundreds of homemade cake squares for the meals. H.O.P.E. couldn’t serve 1,000 children every week without the hard work and compassion of Trinity members!